Jenny K: When I read Julie’s reactions to her latest DVD, Kai Po Che! (2013), I was flooded with waves of déjà vu…I know that sounded familiar to me, that plot…and it was! 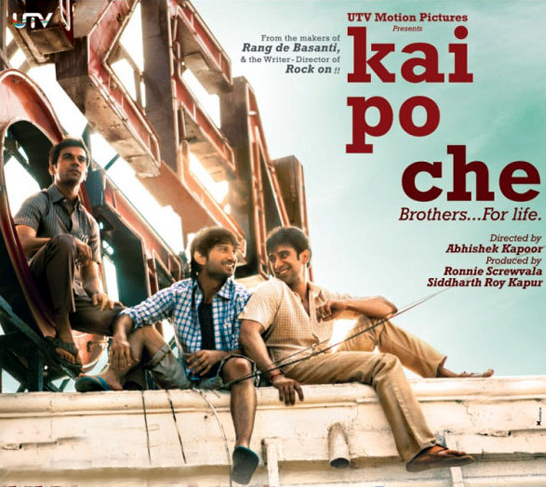 I went to see Kai Po Che! at the theaters with my friend Pat back last February. Julie was kind enough to dig up my original reactions so we can compare them…as follows. Jenny K: Sometimes I wish I research films more before I plunk down my hard-earned-paisa at the movie theater! The trailers are right out there, but did I watch them? No. Check it out. Not saying that I didn’t like parts of it, but I had skimmed the positive review in Rediff (planning to review it myself, so didn’t want to prejudice myself) and had seen the director’s name, Abhishek Kapoor (Rock On!) and the Chetan Bhagat tie-in…well, I went in expecting a Dil Chahta Hai/ZNMD buddy-comedy-drama about cricket, and didn’t get the sentimental feel-good film I expected. Julie M: I must say that I was expecting the same thing, based on that trailer which did seem to focus on the bromance aspect and the joyful title (a shout of triumph in Gujarati, from kite flying), and was a bit disappointed as well, but I still liked it for what it was…mostly. 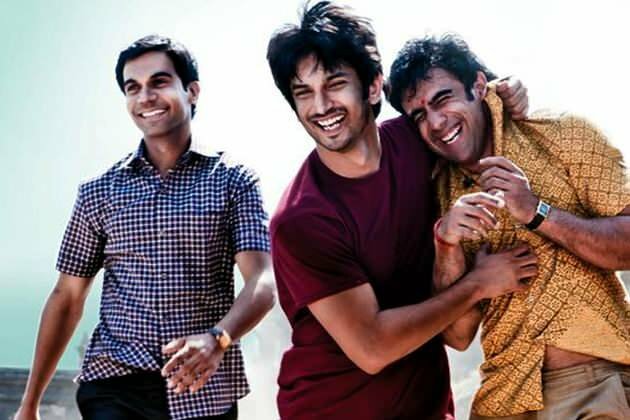 Plot summary: Omi (Amit Sadh), Ishaan (Sushant Singh Rajput) and Govi (Raj Kumar Yadav) are best friends from childhood, now all grown up and out of college but going nowhere. Their dream is to open a cricket supply store/coaching school, but they have no money. Omi ends up borrowing what they need–twice–from his rich uncle Bittoo (Manav Kaul). The boys open the shop and it goes very well, but ironically, they start to drift apart just as they have made their dream a reality. Omi is guilted into assisting Bittoo in his political ambitions, and finds that he likes the work and believes in Bittoo’s ultra-conservative Hindu party beliefs. Ishaan discovers Ali (Digvijay Deshmukh), a young Muslim cricket prodigy and the son of Bittoo’s political rival, and he spends more and more time coaching him on the field and befriending him and his family. Govi secretly takes up with Ishaan’s sister and in order to feel less bad about deceiving him (and to avoid Ishaan’s wrath: he is very protective about his sister), spends less time around his friend. Things come to a head when political feuds turn personal, and a final confrontation turns their mutual lives into a tragedy. Jenny K: I was very off-put with Ishaan’s short-fuse, touchy character, at least until he started teaching Ali. He kept acting as if everything was owed to him, the shop, the money to start the shop, success, everything, when all he had going for him was playing talent (so he says) and the arrogance of the young. When he snaps at outsiders, and also his partners, I found it very hard to sympathize with his problems, at least in the first half…and in the second, the change in him comes almost too late for me. Jenny K: When the film went very political about two thirds of the way through I, not knowing enough of the local political subtleties, was rather lost about who was affiliated with whom, and why things escalated so quickly. I got the Hindu versus Muslim part, but I wasn’t sure if any of the three guys was, in fact, Muslim. Didn’t think so, but it might have made things clearer for me. Julie M: None of the guys was Muslim, but Ishaan was protecting Ali and had come to love Ali’s family. He was acting in the family’s interests and that’s how he ended up where he did. I had the same problem you did: I felt that this final premise tearing our trio irrevocably apart seemed overly contrived and almost TV-movie-ish: set up for the purposes of this narrative. Yes, I know it was an actual historical event but the narrative seemed squeezed in around it. Jenny K: The actors, all relative newcomers, gave very realistic, affecting performances (Raj Kumar Yadav had done a nice bit in Talaash) but I felt the plot of the three life-long friends pooling their talents to start their business had been done better for me in Shuttlecock Boys, even though this film is more polished. It seemed to me that in stretching his scope as a director, Mr. Kapoor may have left the clarity and focus that he had achieved so well in Rock On! a film that I have watched several times, each time liking it more. Too much diversity of theme and intention is not always the best thing, especially in the shorter two hour format. Everything felt a bit thin and unsatisfying for me. I’d be interested to know how desi audiences took to it, or fans of the book. Julie M: Yeah, I thought that the fact it was taken from a wildly popular (but critically panned) Chetan Bhagat book would speak well to it. Not as bad as that horror Hello that Bhagat wrote the screenplay for. At least he surrounded himself with a team this time. Jenny K: Have you read The 3 Mistakes of My Life, the book this film is based on? Julie M: No: I couldn’t stand attempting another CB book. Not my style. But his books tend to be humorous on at least one level, and this film had zero humor at all. Only one brief scene where they all smiled simultaneously, and that’s it. Julie M: It’s almost becoming a trope, three guys “coming of age” and facing tragedy, to the strains of singer-songwriter music. I liked Shuttlecock Boys better—it just felt less self-conscious about being a Message Movie. Overall I felt that KPC had a lot of potential but in the end just left me cold. Because the action of the film was a giant flashback you know the ending–most of it, anyway–and once the political situation comes to a head you’ve figured it all out, and the denouement is almost boring. Except for the final scene, which I felt was tender and perfect and brought me almost to tears. I agree with you that the cast was excellent and it is worth watching for their performances, and to me, for Sushant Singh Rajput alone. And it seems that he comes by the cricket knowledge honestly: his sister is a state-level cricketer! He’s definitely one to watch. Jenny K: He sure is the flavor of the month, these days. Did you see…he has a new movie out, Shuddh Desi Romance, that has been getting pretty good reviews. I’m planning to go see it, soon. Julie M: I noticed that one too—made a mental note to follow it up in a couple of months, because by the time I get the time to go out to the theater it is likely to have left.